A player like Pau Gasol would likely help the Cavaliers reach their postseason goals and his expiring contract makes him particularly appealing. The Los Angeles Lakers feel the Cleveland Cavaliers have nowhere else to turn when it comes to Andrew Bynum, and therefore, can afford to wait on a potential trade involving Pau Gasol, sources said. 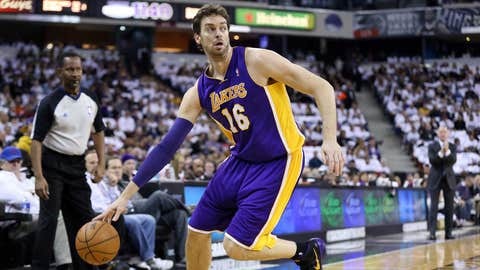 As reported Tuesday, the teams have been discussing a swap of Cavs center Bynum and Lakers forward/center Gasol. The talks have hit a snag, sources said, as the Lakers are seeking more than just Bynum’s contract in return. If the Lakers obtained Bynum, sources said, he would immediately be waived. Ridding themselves of Gasol’s expiring $19-million deal, and waiving Bynum, would enable them to avoid hefty tax-related fines under the NBA’s salary cap. Bynum was suspended by the Cavs for conduct detrimental to the team last week. The Cavs have been trying to deal him since, and will need to make a move before Jan. 8 to avoid paying his full $12.25 million salary. If Bynum is traded or waived, he is due just half. 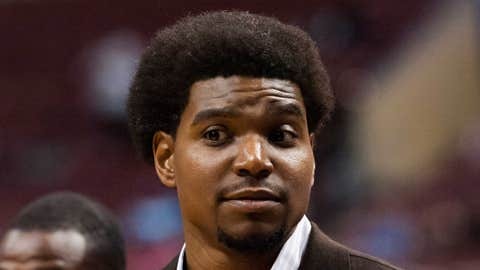 BYNUM WANTS TRADE TO CLIPPERS OR HEAT? Sources said the Lakers would make the Gasol-Bynum trade quickly if the Cavs were willing to part with a small asset, such as a draft pick or a player with a short-term contract. The Lakers are very sensitive to players with long-term contracts, as they desperately want to protect future cap space, sources said. More specifically, in addition to Bynum, the Lakers are believed to be seeking a deal that would expire within the next year or two, or in the "Kobe window," when star guard Kobe Bryant’s two-year contract expires, sources indicated. Cavs guards Dion Waiters and C.J. Miles, forward Earl Clark and forward/center Anderson Varejao all have deals that fit such a timeframe. According to sources, the Lakers appear willing to see what else the Cavs would include in a possible deal before they need to make a concrete decision on Bynum early next week. Meanwhile, the Cavs’ front office is under some pressure from owner Dan Gilbert to make a run at the playoffs, sources said. The team has finished last in the Central Division three consecutive seasons, a franchise first. A player such as Gasol would likely help the Cavs reach their postseason goals, with his expiring contract making him particularly appealing. The Cavs (10-21) have lost six straight heading into Thursday’s home game against the Orlando Magic. Bynum, 26, is averaging 8.4 points and 5.3 rebounds in 24 games, including 19 starts. The Lakers (13-19) are coming off a 15-point home loss to the Milwaukee Bucks and have also lost six straight. Gasol, 33, is averaging 15.1 points and 9.2 rebounds.